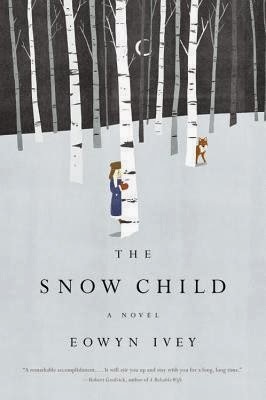 Poignant, melancholy and slow-moving, The Snow Child probably isn't for everyone and I'll admit that it probably would have been a 3 1/2 star if I hadn't read it at such a seasonally appropriate time. With temperatures in the single digits, the wind whipping outside, and my part of the world brought to a halt by the "wintry mix" falling from the sky, this was the perfect book to curl up with and therefore I'm tacking on that extra half star anyway. Well past middle-age, Jack and Mabel strike out on their own when they move to Alaska in the 1920's. Such an adventure would typically be a young couple's game, but Jack and Mabel are lured to the recently acquired U.S. territory in the hope that it will allow them to leave behind the one great disappointment in their lives: the stillborn child they buried in an orchard back home. Proximity to friends and family who have children of their own means that Jack and Mabel's emotional wound has never fully healed, so they purposefully break away in the hope that they will be drawn closer together and move past their grief. It's not long, however, before the long, dark Alaskan winters take their toll on the couple. Isolated in their own spheres--Jack in the fields, Mabel in the home--depression and blame begin to settle into an otherwise happy marriage. In a moment of youthful spontaneity, the couple builds a snow child one night and it's not long before they begin to see a young girl, a wild thing at home in the cold and the forest, moving through the woods and causing them to tentatively believe that maybe they've at last been granted a child of their own making. Based upon a Russian fairy tale, The Snow Child could easily be maddening to those who like definitive answers and clear resolutions. Is the young girl (whose name, we learn, is Faina) an orphaned child, a daughter born of snow and winter come to life, or a figment created from depression and longing? There are no clear answers to these questions, but I don't think they are questions that really matter because, in the end, The Snow Child is about grief and forgiveness. In her portrayal of Jack and Mabel, Eowyn Ivey gives us the basic template for any marriage: no matter how strong the bond, individual grievances, both real and imagined, can build and fester. Whether or not a couple confronts these grievances determines if the marriage will fall apart or hold together. There's also complexity to the characters. At first, Mabel seems too refined and erudite for survival in the rugged wilderness, while Jack faces both the past and the future with unflinching stoicism. As we're allowed into their interior lives, however, we learn that Mabel has hidden strengths that hold her in good stead and Jack hurts far more than he's willing to admit, lest it render him unable to protect Mabel. Through their relationship with Faina, Jack and Mabel confront the painful past together and are ultimately blessed with the life they believed was well beyond their grasp.